Buena Vista’s Colorado Kayak Supply is a retail store that knows how to throw one hell of a party—And, hey, you might even learn something here. If you’re looking for a wet and wild place to paddle on Memorial Day, you need look no farther than scenic Buena Vista, which will transform into a giant paddling party May 22-25. Now in its 15th year, CKS PaddleFest attracts 3,500 outdoor lovers who jump at the chance to test the waters and join in a slew of activities, including equipment demos, instructional clinics, professional competitions, gear swaps, yoga classes, climbing and running events and even a mountain bike race—plus there’s live music and parties that cap off each day. 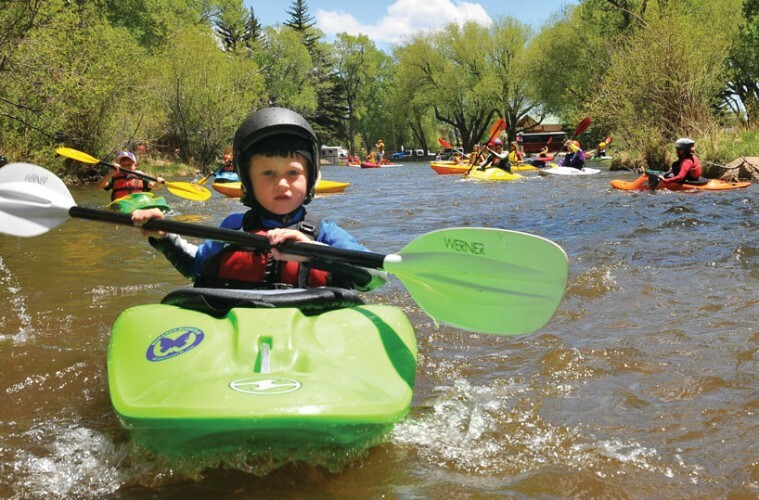 Colorado Kayak Supply, the event’s host, shares the stoke of watersports with everyone, from those who have never picked up a paddle to pros with whitewater running through their veins. Talk to anyone who’s been to PaddleFest and you’ll notice how everyone gushes about how inclusive it is. “Beginners can take their first ever paddling clinic, then they can go and watch the pros compete, and the next day take a clinic from that same pro,” says Earl Richmond, PaddleFest coordinator and CKS co-owner. Two-time women’s world freestyle kayak champion Emily Jackson loves sharing her tricks of the trade at the event. “It’s a great opportunity for people of all skill levels to get together and celebrate the river,” says the ten-time PaddleFest vet. PaddleFest emphasizes participation, with options for both flatwater and whitewater thrills. Some people might delicately dip a paddle in the calm waters of the Town Pond, while others want to charge hard through the Arkansas River in a kayak or on a standup paddleboard. Dan Gavere, one of the nation’s leaders in the sport of whitewater SUP, will be on hand to show wannabe rapid riders how to hang ten in the waves. The event also has a higher-purpose vibe, benefitting a rotating roster of charities. This year’s beneficiaries are the Boys and Girls Club of Chaffee County and the Optimist Club.